Thank you, St. Expedite, for quickly helping my sister. quick question. I was researching st expedite and plan on asking his assistance in some matters. However on one site (not LM) it said to hang his picture upside down. I did not see any mention of that on the LM site (with which I am more familiar and trusting of). I have hard this St. Expedite upside down thing before and I do not know where it comes from. The only Saint I know of where there is a firm tradition of the upside down placement is St. Joseph, but I know some strong devotees of St. Joseph who even take issue with that. Personally, I don't like treating the Saints that I work with in this manner. St. Expedite has come through for me too many times! The way I was taught to work with him, is: make your petition, light a red candle with Fast Luck or St. Expedite oil, set up his prayer card and a glass of water, and tell him that when he comes through for you, you will get him flowers and poundcake. Don't forget the flowers, poundcake, and anything else you feel moved to offer him, When Expedite comes through for you he deserves you to do the same for him. That's how I was taught and it has worked well for me. I never heard of placing Saint Expedite upside down for good luck until recently, perhaps within the past 7 years at most. It seems like an adaptation of the far older and better known Sicilian rite of working with Saint Joseph upside down. Perhaps there has been conflation of working with Saint Expedite for quick good luck and working with Saint Expedite for quickness in general -- because there is a spell mentioned by Doctor Caffrey to Harry Hyatt in which a picture of Saint Expedite is upside down -- but for a death spell, not for luck: it is accomplished by using a 3-pinned candle, a print or holy card of the saint, gunpowder, and a nickel. Turning a picture upside-down is a common way to kill someone in hoodoo. There is a dead crow on Saint Expedite's picture, and the crow is a death-omen bird; furthermore, Saint Expedite carries a sign that reads "hodie," which means "today." The use of explosive gunpowder, the three pins in the candle, the upside down nickel, the command (given by the informant as, "George, I command you to go. I command you to die.") and the involvement of Saint Expedite results in a spell that, when you set off the gunpowder, blows up the Saint Expedite picture, sends the nickel shooting off into the air, and is intended to cause the immediate death of the enemy, as if by a shot. Thank you ladies for your opinions! To me, too, it seems very disrespectful- but since I have never really worked with saints before, I just wasn't quite sure! I"m glad my thoughts align with yours! I never done this, it seems rather harsh. Then again this is a Brujeria tradition, not a hoodoo one. This is done specially to Santa Muerte. I was under the impression that placing St. Expedite's picture upside down was for works of destruction and death magic as recorded in Vol.2, p.1463. Ya'll are describing two ways of working with the saints from two different systems of magic. As I have been taught it, in Mexican-Catholic folk practices and magic there is a tradition of "punishing" saints who do not come through for you. The most common form I have learned is to wrap up the saint figure in a blanket and put it in a drawer, under the bed, or in some neglected part of the house. However, that is not conjure tradition and so is not appropriate for the forum. Brujero, what you are describing is a very specific way of working with Saint Expedite, but it is not "punishing" the saint in the Catholic tradition. I am assuming that the original question was about the most prevalent way of working with Saint Expedite, which is to get luck in a hurry. I, like cat, have heard this upside down thing in reference to Expedite's role as a luck-bringer, and it is in that context that I would not put him upside down. I am curious as to how exactly you petitioned St. Expedite. I've never seen any candles specific to this saint, and while I have found some prayers online they have not yet been effective for me or my situations. What else might I do, specifically, to peition this saint?? Thanks! Fred wrote: I am curious as to how exactly you petitioned St. Expedite. I've never seen any candles specific to this saint, and while I have found some prayers online they have not yet been effective for me or my situations. What else might I do, specifically, to peition this saint?? Thanks! Um, did you check LuckyMojo, ya know, the shop this forum is for? They have a glass encased novena style candle for him. Their is a page dedicated to him here :http://www.luckymojo.com/saintexpedite.html with a few prayers you can use. One thing you must remember is not to call on him for help unless you plan on giving him his due. Flowers and a slice of pound cake is what I was taught he liked. You must always pay tribute when you ask a saint for help but it is said that if you don't properly thank Saint Expedite he will take away what he gave you and more. A red candle can be lit on Wednesday for him. May I check with those of you who has worked with St Expedite before? I've been praying to him lots lately but he did not answer my prayer at all....kinda devastated, to be honest. I've got fresh red roses on my makeshift altar, a glass of water, red candle with fast luck oil and a photo of him which I've printed from the net which I've pasted onto a empty glass. I've also arranged it in such a way that the candle, glass of water, his photo are in the form of a triangle. I've peitioned to him on issues relating to finance. Or does one need to pray for a long time before he'll answer - but I thought he is supposed to bring fast results....? It has nothing to do with what you are doing right or wrong and everything to do with the wisdom of the universe. When we petition Saints for their aid we are asking them for help and sometimes the situation is such that they cannot help us. If you work with them long enough you will run into situations where this is the case. I then consider it my job to think about why something is not happening the way I want it to, and how to bear that gracefully. St expedite has failed for me many times. But came through for me a few times. Also, I think you need to be realistic about what he can do for you and the time you want it in. He doesn't perform miracles, there is another saint for that. Also, the roses and the pound cake are suppose to be given to him after rather than before. Thanks both for your kind advice. May I know which is the saint that work miracle then? I didnt give the pound cake to him, only red roses, can i take the rose away then in my next prayer session to him? How long should I continue before I know that its a failed cause? When I am working with a particular saint or spirit and reach the point where I get a definitive "no," I will often then petition that same entity to help me accept the outcome; to help me discover the positive in the situation that results; or to help me gain insight as to what obstacles make the desired outcome unattainable at the present time. I have often found that prayers for patience are answered where prayers for change are not ready to come to fruition (which is a big deal for me, as patience is not one of my natural gifts!). Anyhow, it's something you might try if it comes to that. I wouldn't take away the flowers you've already given. You can always promise more on the condition of your request's fulfillment. Thanks Editrix for your kind advice. I really hope I wouldnt come to that but I would definitely adhere to what you said about asking the saint on gaining the insights as to why it hasnt come to fruition. A part of me wonder have I jump the gun too early, as it was still only a week since I have started my work with him - but then again, he is supposed to work really fast right? Mabel, Saint Jude is for miracles and hopeless causes. Thanks a bunch, Chagrinedgirl! Any idea does St Jude works with finance and money luck? 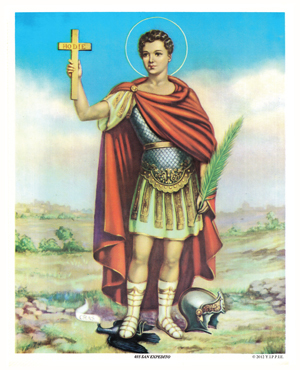 Im really thankful for everyone's contribution here about St. Expedite - somehow it makes me feel slightly better, knowing I can always come here for some form of support! Thanks everyone. I was wondering have you done an unjinxing bath and/or candle on your finances and in general? If you havent then you probably should just to cleanse yourself of the bad stuff coming your way. If you work with St Jude. make sure you repay him after by publishing him in a newspaper because that is how he likes to be thanked. You can't get around that so be prepared. Yes, he can help with anything if the cause is hopeless and all that stuff. But St. Expedite you haven't spent a long enough time workign with him. Personally I think you should continue to work with him, and do not think he isnt working. How would you feel if someone doubted you? Its only been a week! I mean I understand he works quickly, but if its a difficult matter, then you should be more realistic. Just ask for his help and dont put all these stipulations on it. Same things with St. Jude and all the saints. I feel like you have to trust them, and trust that everything will work out for the best. Also, you might want to do a road opener, but for sure do a unjinxing/cleansing if you havent already. Thank you so so much for your kind advice! You know something, its been on my mind a lot regarding doing the uncrossing bath/candle - that I feel there might be some blockage there or something thus it'll be good to cleanse myself or something - and what you've said kinda confirm it. I will do it rightaway tomorrow and hopefully it will work! Would you know if by doing the uncrossing bath/candle, would it affect or clear away all the spell work that I have done recently? I really like to give you a hug for taking the time to advice me - i was really feeling very down about it and was all tears - I guess I have really put so much hope that St Expedite will bringforth miracle to me - and I was so looking forward to doing all that I promise him if he answers me - and was totally crashed when it didnt materalise. Thanks again for your kind support - you wouldnt know how much consoliation you have brought me. Your welcome. Just be patient...I know in the midst of a crisis its hard to but yo must remain calm. No the uncrossing bath will not cancel any work you have done. It removes the negative energy, and all the negative things from you. So I would do that, and a road opener. A person should cleanse themselves regularly anyways not every day but regularly. ALso, you should try a road opener for sure or some Van Van products. I think this will help you for sure. I am sure St. Expedite hears your pleas just keep talking with him, and build a relationship with him. Most of all speak from the heart. Also, you can do an internet search and type in patron saint of (financial matters) or whatever you can type it. I did financial matters, and they say that St. Matthew the Apostle is good. You can pray to St. Jude for impossible cases. I dont think he is just for health matters. The worse things that can happen is that he does not grant your request, but if he does you must publish a thank you. Just trust whomever you work with. For some reason, I think St Jude can help you. You should keep working with St expedite as well, but for some reason if you are in dire need of help like I think you are, then St. Jude seems to stick out. Give him a try. Thanks Star, you're truly awesome!!!! I will heed your advice and start it rightaway. I have purchased the uncrossing spell kit from LM previously thus I will utilise that first - what is road opener? Since I have the uncrossing spell kit with me now, would that be suffice?? Yes, I will definitely pray to St Jude too...and wont give up on St Expedite just yet......thanks again Star, you're truly a STAR!!! ^ The Uncrossing spell kit is the most important right now. It helps remove negativity, and any bad luck. But in the future, you can get the road opener or have lucky mojo burn one for you after you do the uncrossing spell kit. Don't get discouraged, try to remain as positive as you can. This will help believe it or not, and have some faith. Well, I hope you feel better, and your situations gets better. I have worked with Saint Expedite for years and he has come through for me many, many times. When he fails, i do not pay him; when he succeeds i give him pound cake and flowers. The fact that you "pre-paid" him shows me that you are not familiar with this saint or have misunderstaood the traditions concerning him. 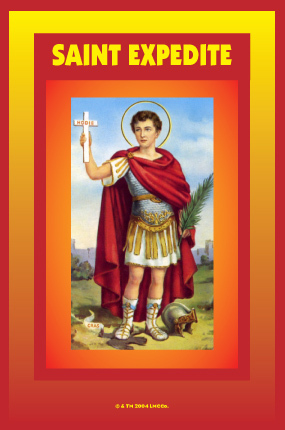 With Saint Expedite you make a promise of payment for results in a certain time-span. If he delivers, you pay. (He likes flowers and pound cake.) If he does not deliver, you know that he has not come through for you and you stop petitioning him. No prayer to Saint Expedite should be ongoing or endless. That is against his nature. A saint is a friend-spirit -- more powerful, perhaps, than your earthly friends, but, like them, not as powerful as God. And, truth to tell, even God does not grant every wish. We cannot judge the successes or failures of your petions or prayers, because we do not walk in your shoes. But grant us the respect that we, indeed, know our own hearts. Your original title for this thread was disrespectful and negative and you asked a very disrespectful question about this saint. This violates the terms of agreement for the forum, which specifically state that you must not post anything that is religiously offensive. The thread title and your text have been changed. Thanks for your advice. I have been enquiring on working with saints, which I have never had before, and wanted to know if I have done anything wrong when it didnt materialise - the fact that I have made offering to St Expedite with flower before the petition was granted - which should be the contrary, could clearly state the fact that I am totally clueless and ignorance with regards to working with him. It's not wrong to come and ask for advice, after all that is the purpose of this forum, to help costumers with Lucky Mojo products. The problem is how one gets to it. You original post title was prone to hurt sensitivities, I haven't worked with the help of St Expedite and even I found it to be harsh and not so appropriate. Remember, that saint has probably helped many others and these people feel attached to this entity, and when you say that he " doesn't work," well, you can expect others to feel offended. Now beyond the lines of magic and hoodoo, is your source of income the kind that could change easily? It's not the same to do money magic when you have a store, sell products or have clients, than when you get a paycheck every month with an specific amount regardless of the amount of work you did. You need to open material doors with things like freelance work or playing the lotto so things can flow along. Maybe I'm mistaken and you work freelance, in that case, change the procedure, do something else. And give the magic time to work. I apologise again for the offensive subject title and am glad that Cat has edited it for me. It was never in my heart nor my mind to be offensive towards the saint - and have in fact come to love going to him each day for prayer. I am also really glad for all the insights that all you experienced veterans have provided me, and most importantly, the support those of you have given me, which truly makes this seem alittle more easier! I would also like to apologise to St Expedite for anything that I have inadvertedly made that is offensive, and should have be more patience and kept my faith in him. Of course asking for advice here is not wrong, and i in turn apologize for getting testy. It's just that i have endured so many years of people calling the shop and asking me, "Are you for real?" that i react a bit strongly to questions that seem to me to be based in that tone of voice. All of us here participate in this forum because we love this form of spiritual work and want to share our knowledge and experiences with others. Like you, i am always given a wonderful uplift when i see the support that folks offer to each other here. Please, do not think that i would wish to drive you away -- only that i wish to keep the emotional tone here respectful to all, including those among us who work with saints. No worries at all Cat, and I can understand where you're coming from. I applaud you for this excellent site that provides such an excellent platform for people like me who are absolutely inexperienced and clueless about magic/spells! Most importantly, the people here are absolutely awesome!! I know I can always come here for any advice and doubts, and the support from these people are always so forthcoming and supportive! And never fails to enlighten me and lighten my heart when things didnt quite yet materalise. Coming to this site has become the very first thing I do every morning whenever I log on to my computer and I think I am getting addicted to this site and the warm people here!! lol!! Keep up the good work everyone! BIG Huggzzzzz!! I agree with Apo. Its like doing spells for a job, but not going out there and applying. You do have to put in some work in a non-spell way. So perhaps thinking of ways you can get some extra income would help. That was a really good idea Apo. I'm unsure how to handle this as it's not something I want to move closer to me or away from me or that I need to keep with me on my property - at least I don't think so. But tossing it in the trash or over my shoulder someplace where it would just end up sitting there waiting for bugs or a dog - well, this almost seems disrespectful of the offering. Is that right? Any ideas? Could I feed it to the birds tomorrow morning? Place food offerings in nature, for the birds and small animals. I saw your reply not an hour ago. (thank you). When I went to walk my dog at 10:30AM, I grabbed the poundcake, intending to place it in the garden in front of my apartment building. I couldn't believe my eyes when I got there. On the corner of the garden area, there was a paper plate - white - with a half-eaten piece of white cake. It had whipped cream and cherries and blackberries on it. I thought "No WAY!" and broke my piece of cake up and tossed it randomly around. I started to walk my dog down the street, asking myself if that could have been a sign regarding my plea to the Saint and my questions regarding the remains. Something told me to look up and low and behold, another piece of cake! This time it was in a white bowl, half eaten white cake with whipped cream and berries on top. This one had a fork in it. It was also perched on a corner of garden area at least 25-30 feet away from the first. My apartment building is obsessive at keeping the garden area clean. Nothing like that has ever been on the grounds before. I truly believe the answer you gave me was confirmed. Thank you! i have a devotion to saint expedite and every time i asked for something is granted,but this time something weird happened , i burned a vigil candle for him and i asked for something and after one day the light went tiny and almost i couldn't see the flame. i knew the answered was NO. i'm still have faith on him and i know if the answered was NO , was because was not conviniencefor me. Did you forgot to pay him? Sugar Pound Cake and mentioning him in public with gratitude are the most used means. yes i paid with pound cake made for me , candle and flowers. what you think was wrong? Not knowing what you petitioned him about and the circumstances I can´t give you an educated guess. Respect his answer and stay away from the thing or think of another way to work on your wishes that does not involve St. Expedite. When he says "NO!" to me his statue usually fall off the altar and his head comes off. No kidding. I feel it best to not push my luck with him when that happens. I have a question about Saint Expedite: I petitioned him last month for some emergency money. I asked him for a specific dollar amount, and burned a 7 day red vigil candle to him. I promised that if he got me that specific dollar amount by the time the candle burnt out, I'd buy him flowers and get him poundcake and publish a prayer of thanks for him in my local newspaper. A day or two before the candle burnt out, I was talking with a friend of mine. She knew I was going through a rough time, and she offered to give me some money. I swallowed my pride and accepted (it's hard for me to ask for help). It wasn't the amount I'd asked St. Expedite for, because I wasn't comfortable asking her for that much money (for the record, I'd asked St. Expedite for $500 and she offered me $200). My question is: I did not "pay" St. Expedite at the end of the candle burning since he didn't get me the remaining $300 another way. Should I have paid him since he got me part of the money? I didn't, since I figure I shouldn't pay someone for only doing part of a job. waterborn wrote: It wasn't the amount I'd asked St. Expedite for, because I wasn't comfortable asking her for that much money (for the record, I'd asked St. Expedite for $500 and she offered me $200). So are you saying you could have had more than the $200 but were uncomfortable asking for it? If St Expedite gave you the opportunity and you turned part of it down, it wasn't he who didn't come through. Also keep in mind if you don't pay him, he will take back what he gave you and then some. I probably could have gotten more, but I felt uncomfortable asking for it and thought perhaps St. Expedite would have come through with the rest of the money in another way. I will go ahead and pay him. Now I see what I did wrong. i'm happy for you that your recognized you did wrong. so go ahead and pay to him and you will see how many things he can does for you. I would like to ask St. Expedite to help bring my lover back. What is the best way to go about this. Can I use it in conjunction with my honey jar or mojo bag? again, he worked for me twice this week. to someone that need to ask him for something , be honest and talk to him like you talk to your best friend. he work. daviscol wrote: Is there a better saint to ask for help with Love? St. Valentine has helped me in the past with love. This is the second time I've petitioned St. Expedite and the first time, I screwed up and didn't pay him; the story is posted elsewhere on the forums. I don't want to mess up with the saint a second time. This time, I used a smaller candle because frankly, I needed the amount of money faster and the prayer I used was to have the money I needed before the candle burned out. It took about 4 or so hours for the candle to burn out. I needed money to pay a bill, and I asked St. Expedite for more than was needed so I'd have extra in case of an emergency because I'll be travelling this weekend. My question is this: About two or three hours after the candle burned out, my father called and loaned me the money to pay the bill. I get the feeling that I should pay St. Expedite what I promised him (flowers, a slice of pound cake, prayer of thanks in the paper). What do you all think, even though the saint didn't give me all the money I specifically asked for? From talking to my reader and what I have read, I would pay him or he can take away just as fast as he gives it. If you are travelling you could break down and have car expenses or other unforseen things come up. I agree with the others, I would pay him. Clearly his interpretation was that you got what you needed. A couple of things to keep in mind when petitioning Saint Expedite (or any saint or spirit, for that matter): 1. Be very specific. 2. Be very gracious. As a good rule of thumb, I always try to place requests in a manner to which I'd feel receptive if I were the one hearing them. I try to be quite clear; I would think it was unreasonable if someone were asking me to do a job with only a vague set of guidelines when they clearly had something specific in mind. And I think any of us are more kindly inclined to fulfill someone else's request if it's made sweetly and with good grace as opposed to demandingly. Also, I like to communicate on a regular basis with those beings with whom I feel a connection rather than waiting until I need something from them. (We all know those people who only call when they need a favor and then fade away until the next time we can be useful, and it's less than endearing.) I'm by no means suggesting that you've done anything amiss in your communication with St. Expedite. I'm just sharing what helps me establish a good mindset in working with the saints in the hope that it will help you too, as you seem to have encountered some frustration lately. I wish you luck. THANK YOU SAINT EXPEDITE FOR FAVORS BESTOWED! one more time Saint Expedite worked for me. i want to say thank you in this post. i want to let everybody know that when you have faith and devotion he answer your petition. thank you Saint Expedite, i made the pound cake and i put yours flowers and candle in the altar. This message is for waterborn... I was thinking that perhaps that reason why St Expedite only gave you a portion of what you asked for is because that amount would cover what you truly need. I practice Vodou and there are certain spirits, like Ezili Danto... who will just give you the basics. Nonetheless, she will always take care of her children, but it will just be enough for the essentials. lucky7clover wrote: This message is for waterborn... I was thinking that perhaps that reason why St Expedite only gave you a portion of what you asked for is because that amount would cover what you truly need. I practice Vodou and there are certain spirits, like Ezili Danto... who will just give you the basics. Nonetheless, she will always take care of her children, but it will just be enough for the essentials. Funny you should mention that, lucky7clover; I have been studying Vodou for about a year or so on my own, and Ezili Danto is one of my lwa She does take care of me, but I'm still learning how to live with her as a mama I'm getting ready to move up to the Boston area where hopefully I'll find some serviteurs to talk with in person and fetes to go to. I've been on my own with books and such; Kenaz Filan has been helping me over the phone and in email, she's been awesome. 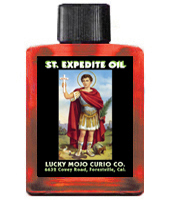 Yes, St. Expedite has come through for me both times that I petitioned him, and only with the essentials. I will keep that in mind. I guess I'm meant to get out of my credit card debt on my own. I have been familiarizing myself with st expedite recently due to some matters I would like him to take care of. However, I cant burn the candle at my home on my behalf, as I have mentioned before, and would need LM to do it for me. How do I get around the issue of thanking st expedite? Does LM take care of that too or is it still my responsibility? i'm not sure, but i think is your responsability because is some matters between you and st expedite. I recently put a picture of St Expedite on my altar. I originally intended for him to help me with procrastinating my career as a writer. And I was going to create an altar to writing... that somehow got procrastinated, since something else happened so I am using him for another reason. But twice this week my mom asked me "When are you gonna finish your book already?" I swear its St Expedite talking through her! Like she has never asked before... I always thought that she thought my writing was a pipe dream.